Hello, my lovely travel giraffes! Thanks for all the love on my last travel post. Today, however, I’m bringing a challenge closer to home. I went to explore to see what treasures, spots and hotels near London Bridge I could find. Needless to say, I was excited by this and can’t wait to share what I found during this exploring London Bridge challenge. I started off late morning and after contemplating my trusty guide, Google, I decided to see what was down Bermondsey Street. Let me tell you, there’s a lot! 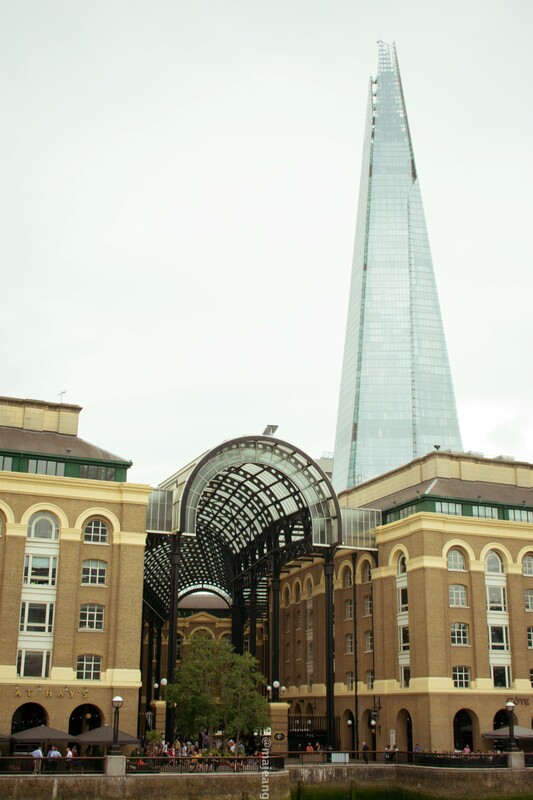 Situated next to the newly opened London Bridge rail entrance and exit, this street is filled with lots of goodies. There are lots of quirky shops, art galleries, restaurants, bars and coffee shops. I stumbled across a glass blowing shop with exquisite glass pieces and the White Cube Gallery. The gallery is a large expanse of space with some interesting pieces. My favourite pieces were the ones suspended from the ceiling and seemingly floating in the air. There was a cute lifestyle shop with beautiful pieces of jewellery, hats, scarves, candles and the like. I couldn’t resist getting one of the candles because it smelt so good! This exploring London Bridge challenge can cause you to work up and appetite because by this point I was absolutely starving! I went to the aptly named, Absolutely Starving cafe that served hot food, salads, and the most delicious looking baked desserts. Seems like everyone else was starving too so I couldn’t get a seat and ended up at trusty Pizza Express. I did make a mental note to return for a chocolate brownie and it was so worth the wait. Once the hangry beast was satiated, I strolled through Hays Galleria and walked along the riverside. The views are stunning and I love how the landscape all create a cohesive and beautiful cityscape. One of the parts of this landscape is the HMS Belfast. I’ve seen it several times walking along the river but didn’t realise you could go on it. So I did! There’s a wealth of Britain’s history on this ship. You learn about the workings of the ship and how they used Morse code to communicate. Plus, you get to visit the Admiral’s bridge and see how he saw things, which is pretty cool! After all this exploring a girl can get thirsty especially in this glorious heat. With that in mind, I decided to visit the Shard and found a new bar, well new for me. Next to the Shangri-la hotel entrance, I found Bar 31. A little champagne and cocktail bar with a bit of outside space just under the lifts to the train station. This was the perfect place to sit in the shade and sip on a well-deserved drink. Now tell me, what are your favourite places to explore in London? If you haven’t been to London yet, would you like to go exploring? Let me know in the comments below. Thank you to Hotels.com for sponsoring this exploring London Bridge challenge post. As always, thank you for reading, commenting and subscribing.